Sarah Taylor is used to causing headlines for dabbling in men's cricket. Formerly a pupil at Brighton College, her selection for the boys's first XI alongside now-England team-mate Holly Colvin raised the ire of then Marylebone Cricket Club (MCC) president Robin Marlar. "I think it's absolutely outrageous," said Marlar at the time. "If there's an 18-year-old who can bowl at 80mph and he's been brought up properly then he shouldn't want to hurt a lady at any cost." Bar the odd dissenting voice - earlier this month, an anonymous Daily Telegraph writer took Marlar's line that male pacers might not be too happy at being asked to bowl to Taylor - the reaction to her possible appearance for the Sussex men's second XI has been more positive. The Telegraph's Tanya Aldred hailed Taylor as "perhaps the greatest female cricketer England have ever had", former England seamer Mike Selvey called the 23-year-old "the finest of all women cricketers" in the Guardian, while cricket journalist Lizzy Ammon said the wicketkeeper-batter could be a "trailblazer". A potential trailblazer indeed, but one who was almost lost to cricket entirely. Having won the Ashes, World Cup and World Twenty20 by the age of 21, Taylor pondered what she had left to achieve in the game and decided in 2010 that a break was needed. She would not play for England again for almost a year. "I didn't really know what I wanted to do with my life," she told BBC Sport. "I decided to venture away, explore other avenues within my life to see if I wanted to stay in cricket or go elsewhere. "I went to New Zealand to visit family. I didn't want to touch a cricket ball, but over the Christmas I hit a point where I wanted to play. "I got a call from Wellington - they said their captain was injured and they needed a batter. I jumped at the chance, turned back to England and they were brilliant." That Taylor is now being touted for a possible move into the men's game says much for the positive impact the sabbatical did for her. But she is also a beneficiary of an increasingly professional approach to women's cricket in England, with players able to devote more time to their sport thanks to contracts that see them employed as coaches in schools and clubs. That luxury was not afforded to Taylor's England team-mate Arran Brindle, who herself took what turned out be a five-year break from international cricket in 2006. Her decision was made when regular journeys from her home in Louth, Lincolnshire to training sessions in Loughborough became unmanageable - circumstances a world away from the environment that has allowed Taylor to move to the brink of a shot at the men's game. "To fit in a training session was a minimum six-hour event," said Brindle. "To do that around work, having done it for three years, it felt like the right time to see what else was out there for me to do." If Taylor can see similarities in their situations, Brindle's achievements in men's cricket could also be a source of inspiration. As well as being the first woman to have scored a century in a men's Premier League club match, the 31-year-old is also the only female to have captained club side Louth - a team that included her husband, James. "For a bunch of guys to approach a girl to captain the team for the first time was a massive honour," said Brindle. "The fact my husband was playing was irrelevant - he was just another player. "We were pretty successful, so that made things very simple at home. I dealt with the batting, he dealt with the bowling and it worked pretty well as a team." An improvement in facilities near Brindle's home allowed her to train alone and paved the way for her to return to international cricket in 2011. Now, however, not only does she juggle sport with her career as a teacher, but also her commitments as a mother, after son Harry was born in 2008. "There are periods that Harry and James aren't with me, but we try to keep them to a minimum," she continued. "I'm very fortunate that they can come and join me on tour. "To Harry, mum just plays cricket. On tour, he finds it more fun playing corridor cricket with the all the other girls - he just thinks that's part and parcel of being a four-year-old." 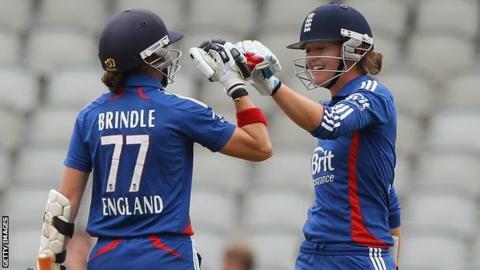 Taylor and Brindle may have had differing reasons for their breaks from international cricket - and vastly differing experiences when they were away from the game - but, as they prepare to defend the World Cup which England won in 2009, they agree that time removed from the fray has helped them as cricketers and individuals. "You've got to have a balance," explained Brindle, who was not part of the squad that lifted the trophy in Australia. "Harry really gives me the opportunity to switch off. If you've had a good day he's the same as if you've had a bad day. "He has a smile on his face, wants to play and spend time with you. It's a real leveller, keeping you fresh and enjoying your cricket. "But you need the drive. The thing that made me want to come back was the competitive edge that these girls train and play with day in, day out." Taylor, about to play in her second World Cup, concluded: "I can't picture me doing anything else in my life that would give me the same feeling. "I'm currently doing an accountancy course and I can't imagine getting the same rush building a purchase ledger. "There was a time when I thought 'what else is there to do?' Now I think 'I want to do that again'." If England do lift the World Cup on 17 February, there is a good chance Taylor will be in the headlines once more. This time, though, it will not be for any flirtation with men's cricket, rather an achievement that she, and Brindle, might otherwise have missed out on.